Bend Chiropractor, Dr. AJ is dedicated to providing exceptional care to you and your family. Our goal is to provide your family with a holistic approach to achieving optimal wellness! Our primary focus is on the detection and correction of spinal interferences. Our chiropractor will evaluate your spine and nervous system, providing gentle chiropractic adjustments to restore your body's innate potential to self-heal. A healthy nervous system insures you are able to maintain a state of overall balance and well-being. Dr. AJ Garis is a native Oregonian raised in the small town of Aurora. He was introduced to the miracles of chiropractic at the age of 12 following a go-karting accident. Dr. AJ earned his first Bachelor of Science in Geology, at Oregon State University. For a time he pursued a rewarding career in Geology before being called back to chiropractic. Dr. AJ earned his Doctorate of Chiropractic from the University of Western States in Portland. Concurrently he earned his second Bachelor of Science in Human Biology. Throughout his studies he maintained Dean's List and received additional training and certifications in; Webster Technique for peri and postnatal care, and Graston Technique to reduce scar tissue and mysofascial adhesions. As a student focused on outreach, he founded "The Art of Chiropractic" club to help students practice their skills. In 2014 he organized a humanitarian trip to Peru, where 15 students provided chiropractic care to the impoverished people in the remote villages. Through Dr. AJ's professional education and personal experiences with his daughters, he elected to focus his skills and passion toward pediatrics and families. "When we adjust children, it often is not due to pain or injury; it serves to stimulate their nervous system and remove interferences, which helps them function at their highest abilities." This concept is not restricted to children, which is why Dr. AJ's passion is to check children and families for spinal subluxations. Thus allowing the entire family to function at their highest abilities. He emphasizes and educates his patients on the benefits of living a healthy lifestyle through exercise, nutrition, and chiropractic care. This proactive approach helps individuals and families achieve and maintain their optimal healthcare goals. In addition to taking care of his patients Dr. AJ enjoys spending time with his wife Stephanie and their 3 daughters: Eliza, Lucy and Olive. As a family they enjoy experiencing the great outdoors, which is what led them to relocate to Bend in 2016. In 2010, Becky graduated with honors as a massage therapist and health educator from the National Holistic Institute in San Jose, CA. Blending modalities such as myofascial release, force line and trigger point therapy, Becky helps clients eliminate acute and chronic pain. She tailors her bodywork to each individual client, incorporating stretches and exercises into her sessions. Massage therapy addresses the 650 muscles of the body and, in conjunction with chiropractic adjustments and proper nutrition, helps keep the body in proper alignment, balance and function. 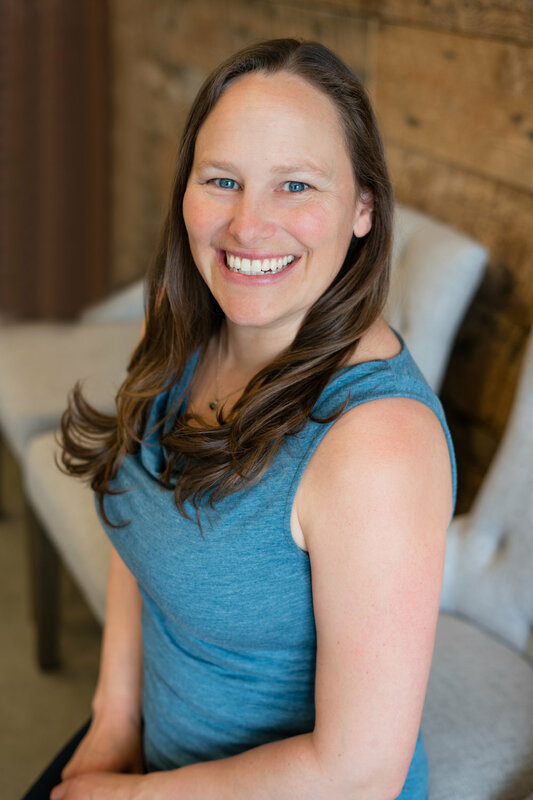 Becky is a current member of the American Massage Therapy Association (AMTA) and board certified (BCTMB) through The National Certification Board for Therapeutic Massage & Bodywork (NCBTMB). Prior to becoming a licensed massage therapist, Becky worked as campaign manager for Team In Training, the largest fundraising and endurance training program of The Leukemia and Lymphoma Society. Through Team In Training, this former collegiate gymnast and collegiate coach became an endurance athlete and inspired bodyworker. Becky has completed numerous half marathons, marathons, 100-mile bike rides, half ironman triathlons and 2 Ironman triathlons. Becky, her husband Ryan and their children Olivia and Owen enjoy living a healthy Central Oregon lifestyle. You can usually find the family at one of the many city parks, near a lake or river, on a bike, running or enjoying a meal at any one of their favorite local establishments. "Love Dr. AJ! My 3 year old nonverbal son with an extensive medical history has responded so well to chiropractic care, and Dr. AJ always works with him in such a gentle, noninvasive manner, which draws him in! My 18 month old daughter has taken well to Dr. AJ too, his caring disposition radiates with how he treats his patients! My husband and I have also been adjusted by Dr. AJ with great results. Plus he kindly discusses lifestyle practices to promote overall wellness. We love Discover Chiropractic!" - Natashia K.
"AJ has been instrumental to my overall wellness in many ways. Not only has he helped my back/spine through regular adjustments, he has been very happy to offer various opinions on overall well-being and wellness. His logical approach to 'body happiness' and well-being has been one that I particularly appreciate. He is extremely knowledgeable in health and the welfare of the body. Not only can he provide guidance to adults but he has also offered opinions on the wellness of my young children. He possesses a genuine interest and zest for assisting people with being the best version of themselves. Without hesitation, I would recommend AJ wholeheartedly. Your body will thank you afterwards." - Nick W.
"Dr. AJ takes a fantastic, comprehensive approach to chiropractic care and wellness. Treatment isn't only about office visits, but also about the home care and lifestyle improvements that can get you to successfully overcome the issues that brought you to the clinic in the first place. Dr. AJ is also a great all around person who takes a personal interest in his client's well-being. Portland's loss is certainly Bend's gain!" - Ian F.
"Dr. AJ is a very wise and effective chiropractor. He understands and effectively communicates how the body works as an entire system. His approach is brilliant as he seeks to understand what is causing any specific problem. I also always enjoy our conversations during my appointments. I would recommend him to anyone ranging from young children to senior citizens." - Jake M.
"I was experiencing a lot of back, hip, shoulder and neck pain. After seeing Dr. AJ twice a week for the last two months I hardly have any pain at all. I was facing cortisone shots and main meds. So happy I don't have to worry about that anymore. I highly recommend him." - Cindy M.
"I started visiting doctor AJ around my 27th week pregnant - was having terrible mid-back and hip pain. After just a few visits my issues have gone away. I have continued to go regularly and it has made my pregnancy so much better! Now 35 weeks and feel amazing. Highly recommend everyone to see him! I honestly look forward to my adjustments, doctor AJ is very passionate about his work and pregnancy. I have nothing but great things to say and could continue on and on. Thank you for everything - I'll now be a lifer." - Corie P.
"Dr. AJ, In the past 8 months you've helped me tremendously. Relieving pain, tension, stress & making me feel 100% comfortable. I can't thank you enough!" - Angela W.
One of our goals is to partner with a wide range of insurance providers to provide care to as many members of the community as possible. Below is a list of our accepted insurance partners. At Discover Chiropractic, we accept most major medical insurances. Don't see your provider above? Give us a call and we can answer any insurance questions you may have.